This page is about the undergraduate major in Athletic Training. See information about the Master of Athletic Training program. The athletic training program is an integral part of the Program in Exercise Science and the College of Health Sciences whose mission is to educate excellent, ethical health care providers. This mission, coupled with a dedication to recruiting and retaining students from diverse backgrounds, serves as the template for excellence in education and diversity. The mission of the athletic training program is to enhance the quality of health care for the physically active through prevention, evaluation, management and rehabilitation of athletic injuries. The athletic training major supports the mission and educational philosophy of Marquette University and strives to develop men and women who have a allegiance to life long learning, and who will dedicate their lives to the service of others. Marquette’s athletic training major was reaccredited through the Commission on Accreditation of Athletic Training Education during the 2009-2010 academic year for the maximum timeframe of 10 years. The next reaccreditation assessment will occur in the 2019-2020 academic year. Athletic Trainers in Wisconsin and most states must be licensed as an Athletic Trainer by the Department of Regulation and Licensing in order to practice in that state. To be granted an Athletic Training license to practice, individuals must achieve a passing score on the Athletic Training Certification exam administered by the National Athletic Trainers’ Association Board of Certification (NATABOC). 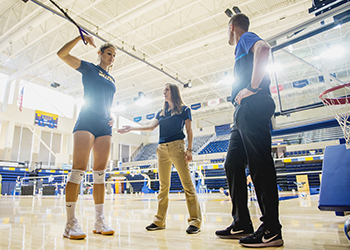 Graduates of Marquette’s Athletic Training major are eligible to challenge the NATABOC Certification exam at the end of their undergraduate major. Marquette Athletic Training students have compiled an impressive pass-rate on this examination over the years. While the MATR at Marquette won’t have graduates until 2020, the current pass rate for the undergraduate major in athletic training at Marquette can be viewed here: Marquette Athletic Training Exam Statistics from the CAATE website as of July 2017. Demonstrate technical proficiency in the field of athletic training as outlined in the Athletic Training Educational Competencies and Proficiencies of the National Athletic Trainers Association (NATA). Apply critical thinking and evidence-based decision making in creating and implementing plans of care for both athletic and general populations with a variety of both acute and chronic conditions, as evidenced by site supervisor assessment in applied/clinical settings. Exhibit values consistent with the Jesuit tradition of lifelong service and caring for others through the safe and ethical practice of athletic training as outlined by the National Athletic Trainers Association Board of Certification (NATABOC).